Here are some frequently asked questions about our containers. 1. How big are the containers exactly? Interior Size 19' 4.5" 7' 8.5" 7' 9.75"
Interior Size 39' 5.5" 7' 8.5" 7' 9.75"
2. What do the container terms—ISO, conex, shipping, storage container—mean and what's the difference between them? Containers have many names. ISO, cargo and shipping container are terms generally used when shipping containers commercially overseas. Connex or conex is a military term for the same thing. Storage container is just one more term for the same thing. A cargo container/conex/storage container, etc, refers to cor-ten steel cargo containers that meet international standards for shipping. However some people use storage container to include non-shipping containers like a national moving and storage brand. Please note that those "containers" that national moving and storage companies use are not shipping containers. They are made of aluminum, plywood and fiberglass. They are not made of steel, they have an opaque plastic roof instead. They lack the strength and security that cargo containers provide. 3. What do container parts look like? Sometimes when you are planning, it would be helpful to know what exactly a container part looks like. Here are pictures of specific parts of containers. 4. What is an open-top? Hard-top? Open-side? Specialty containers are just that—containers that fit a certain need. Most of these containers are only available in either one-trip/"new" condition or cargo-worthy condition because they aren't that common. For information on different specialty containers and pictures, see our Specialty Container page. 5. How do you open the doors of the container? 1. What condition are your containers in? Our containers are in "wind- and water-tight," "cargo-worthy," and "one-trip" condition. Basically we run the range from used containers that are suitable for dry storage all the way up to beautiful containers that are here fresh from China. For more details on the different conditions and what they mean, check out our New & Used page. The page has a gallery of different containers marked so you'll know which is which. 2. What is a one-trip container? A one-trip container is a container that was manufactured in China, filled with goods and then shipped to the US with the intent of being sold right away as a "new" container. While they are technically not new (they were used once to get them here), but they are as new as we can get here in the US. One-trip containers generally will be a solid, neutral color. They do not have shipping line markings of them and are free from rust and large dents. Because they have made one trip here on a ship, they may have some minor blemishes. 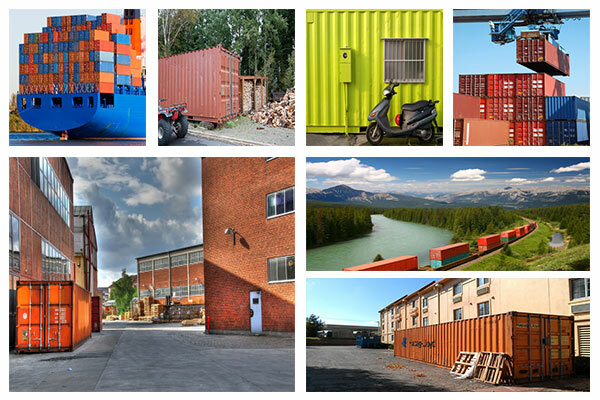 See pictures of one-trip containers on our New & Used page. 3. What is an A, B, or C rating? Ratings like A, B, and C are subjective ratings that container companies give to containers. What constitute an "A" grade at one company may be a "C" at another. For that reason, we do not use them. We use industry categories: wind and water tight, cargo-worthy, IICL and one-trip containers. 4. I want to ship my container overseas, but don't want to spend a lot. What do I need? If you want to ship something overseas, you have 2 options: you can use the shipping line's container or you can get your own. If you want to keep the container once it gets to its destination, buying your own container may be the right choice. If you do that, you will need a container that is cargo-worthy. Used containers that are in cargo-worthy condition are structurally sound enough to make the trip to its destination without any issues. When you ship a container overseas, be sure that your container is cargo-worthy and be sure to get a survey, which is a certificate that shows the container is cargo-worthy. Shipping lines will require the survey before they allow the container on the ship. 1. Why can't I find prices online? Container pricing is based on a lot of different factors—where will the container be going? Where is the closest container we have to that location? Is there another location in the region that might offer better pricing? What size and condition do you want? All of those factors mixed together with the fact that containers are a commodity, so pricing changes constantly, all come into play when calculating a price quote. No software can compare with having a human calculate the best pricing for your needs. 2. Why do you need my city and state or zip for a quote? Container pricing is based on a lot of different factors, but location is the biggest factor. If we have your city and state or your zip code, we'll be able to see which locations we have are closest to you and calculate the best pricing both on the container and delivery to you. 3. Why do you need my phone number or email address for a quote? In order for us to get back to you, we need to have a way to do that. Our website doesn't know who you are, so if you give us either your phone number or email address, we can get back in touch with the pricing information. If you do not want to give that information out, simply give us a call! 4. I want a container that comes out of my city and state, can you do that for me? We have locations throughout the United States where shipping lines sell containers. They are generally larger rail cities. We do not have containers in cities beyond those, but we can truck them from the closest location we have to you and provide you with the pricing on the container and the trucking. 5. My buddy found one for $1000, why are yours more? All container sellers are asked this frequently. When did your buddy buy that container? 10-15 years ago? Even then, they were more than $1000. Containers have gone up in cost over the past few years. There was a shortage of them for a few years during the Recession, but availability and pricing has been getting better since then. However, we will probably never go back to the $1000 container. The reason? They are worth more than that. Even if you scrapped a perfectly fine container, with current steel prices, a container is worth more than that. Now add in that the steel is set up in a nice, dry container and the value is more than the scrap value. 6. Aren't there too many of these containers? Can't I go to a port and buy one? No and no. There aren't too many of them, despite old internet stories to the contrary. Shipping lines use containers for about 7-10 years before they sell them. That means that even though you see a stack of containers sitting at a port or rail yard, they are not necessarily empty or available. Shipping lines store them to ship their customer's goods to the next location. Ports and rail yards do not own these containers, the shipping lines do. Shipping lines do not sell to individuals, so you need to purchase one through a container vendor. 1. How is the container delivered? Containers are delivered in a variety of ways: tilt-bed trucks, flat-beds and chassis. All have their own pros and cons. But for most of our quotes, we price out tilt-bed delivery. The tilt-bed truck sets the container on the ground for you, so you don't need to have any equipment on hand. 2. What is the difference between a tilt-bed, flat-bed, chassis and trailer? They are different types of trucks that deliver containers. Tilt-bed trucks set containers on the ground. Flat-bed trucks are used for shipping containers longer distances, but cannot set them on the ground. Chassis are used when the container is being shipped overseas, since that is the type of trailer allowed in ports and rail yards. For more information on the different kinds of delivery including a video, see our Container delivery. 3. What do they need from me to drop off the container? If we are providing ground-level delivery to you, we need enough room on nice firm ground to do that. The driver will back up the truck to the spot where you want the container set down. The back of the truck tips down and there is a winch that lowers the first end of the container onto the ground. Then, the driver pulls the truck forward and uses then winch to finish setting the container on the ground. During this process, the driver cannot turn the truck at all, we need the length of the container plus the length of the truck plus enough room for the truck to turn to get out of the spot. That translates to 110' for a 20' container and 130' for a 40' container. In addition, when we set containers on the ground, the container pushes down and out on the truck, so we need very firm ground that is relatively flat. Paved surfaces and gravel are best. We cannot delivery on grass/lawns or in fields. 4. Can you deliver two 20' containers on one truck? Yes we can. Two 20' containers take up the same amount of space as one 40' container. So we can bring both 20's at the same time, saving you money. 5. Why is shipping so much? Containers are delivered on large, tiltbed trucks. These trucks generally are expensive to maintain and are in high demand. In addition, rarely can a container be delivered and then the truck do something else on the same run, so the driver will be making a dedicated trip to bring your container to you. When you put that all together, that generally makes ground-level delivery more expensive than having something brought out on a flatbed or other type of delivery. 6. Can you move my full container? We do not move full containers. We do not have the appropriate insurance for doing that. In addition, moving full containers have their own set of requirements. For more detail in that, check out our blog post on moving full cargo containers. 7. Will you set up the shipping of my container overseas? No. We do not set up international shipping. We do, however, make sure that if you buy a container that you will use for shipping overseas, it will be all set for export. That means making sure it is a cargo-worthy container, that it has a survey/certification and is numbered appropriately. Those services do have additional charges, so please make sure you let us know upfront that you are looking for a cargo-worthy container. 1. I want to modify my container myself, but don't want to reinvent the wheel. Can you help? Absolutely! We have kits for adding in man-doors, roll-up doors, windows, HVAC units, venting, skylights and much more. All of the kits come with framing to fit into the corrugation of the container. You cut the appropriate sized hole, weld in the framing and then install the door or window. The HVAC units come with a cage for additional security. We also have partitions, partitions with doors, platforms, etc, for making your container into whatever you want. For pictures of these kits, check out these pictures of container modifications on our modification page. 2. Can you modify my container for me? Definitely! We have shops located throughout the United States. Our shops can install and of the modifications listed above and can also do custom modifications for all types of projects: industrial modifications, residential modifications, commercial modifications. If you share a drawing of what you want done, we can price that out for you. For ideas, check out our Container Modifications page, our container gallery and our blog posts on container modifications. 3. I want to make a house out of containers, what will that cost? It is difficult to say. Much like building a traditional home, it depends on the size of the house, how much we need to do to the containers, and how much you want to spend on plumbing, electric, data, flooring, etc. We do not design homes; we modify containers to fit our clients' specifications. We do not have any pre-made homes or set floor plans. Customers bring their designs to us and we price them out. Pricing is based on the amount of work involved in those plans and the supplies needed. Did we miss a question you have? Please let us know! Please call (877) 374-5452 or email at info@supercubes.com.